The previous article provided an introduction to unit testing in general covering the purpose and benefits of unit testing. This article now looks at a method of unit testing that can be utilised in a SAP DataServices project. First we’ll discuss what objects are candidates for unit testing and then look at how we implement the unit testing of these objects. If the “unit” in unit testing is the smallest piece of executable code what are the units in a SAP Data Services (SDS) project? What is ‘executed’ in SDS are jobs so are then jobs units? Not necessarily as the job itself can be complex and execute many workflows, dataflows and scripts and so the job can be broken down into smaller areas of functionality. Similarly workflows are not candidates for unit testing as they can contain several dataflows and scripts. Dataflows, scripts and custom functions are areas of code that can’t be broken into a smaller unit and so are therefore candidates for unit testing. It is possible create a dataflow that performs a series of complex transformations and as such testing each transformation in isolation would be desirable. However as yet SDS does not yet provide a mechanism specifically for this; although embedded Dataflows can be used to break up a large, complex dataflow they are difficult to execute and unit test in isolation. SDS contains other objects such as datastores and file formats however these are static in nature and so are not candidates for unit test. The unit tests for dataflows will highlight any defects with a datastore or file format. Although automation of a unit test is not essential as the test can always be done manually it does have some key benefits. Automation ensures consistency in the unit test in that every time the test is run the exact same tests are applied. In addition automation also reduces the overall development and system testing effort. As we will see there is some effort required to build the automated unit test however effort is saved later on when the re-execution of unit tests become just a single click and the automated unit tests naturally lead to building a regression pack. In the following section we will look at how to construct a unit test for dataflows, custom functions and scripts in turn and also look at how to construct an automated unit test. Dataflows can be unit tested by reusing the dataflow in a new Job that is created specifically for unit testing. A job in SDS may consist of many workflows and dataflows and executing the entire job is therefore impractical for unit testing. However SDS allows the reuse of components such as dataflows in more than one job and we can exploit this in order to create our unit test jobs. In the illustration below we have a schematic of a production job where a series of data flows load data from source systems into a staging area followed by dataflows that move the data into the historical data store (HDS) and finally into the data mart. Also displayed are separate unit test jobs where the dataflows of the main job are reused individually in separate jobs. Just reusing the dataflow in another job for unit testing is usually not enough as we want to automate the unit test and we also need to remove any dependencies that the dataflow has with any other dataflows or scripts in the main production job. So first of all we’ll look at how to remove these dependencies followed by how we then automate the unit test. if the script or function is defective then the unit testing of the dataflow is blocked until this is resolved. Here we have a dependency between the dataflow and the script that generates the batch date and number and we need to remove this dependency in order to be able to unit test the dataflow. To do this we use a different script in our unit test job and hard code the values for batch number and batch date. So our production job contains a script that executes before the dataflow that generates required batch date and batch number while in our unit test job we use a different script that uses a hard coded batch date and number. Using a hardcoded fixed value for the batch date and number in the unit test job makes sense as we need the unit test to be consistent and as we’ll see later this is also necessary if we want to automate the checking of the unit test results. The variables are local variables and parameter calls are used to pass the values to the dataflow. Although global variables can be used it is not recommended as using global variables can hide dependencies between separate areas of code . This script that we add at the beginning of the unit test jobs is referred to as the initialisation script and we’ll see more uses of this script later. A second example of where dependencies arise is when using environmental values such as system date, here our dependency is not so much on another part of the job but instead we are depending on an environment state. For example if a dataflow filters to only select “this weeks” data then the source data that is being used for unit testing would need to have some records that fall within this week and some that don’t. The obvious limitation here is that as the weeks go by we’ll need to keep updating our source test data set in order for the range of dates to cover the current week when we’re running the test. Then set the variable to the value of the system date in a script ahead of the dataflow. Then in the unit test the dataflow is reused in the unit test job but now a different script is used to set the variable to a known fixed value. We now have a unit test job for dataflows that can be run manually and results checked however what we want is to automate the unit test and the next section looks at how we can do this. An automated unit test of a dataflow would consist of executing the dataflow’s unit test job and have the job itself output whether the test has passed or failed. There are two aspects required for automation: the first is that the data set used in the dataflow processes (both source and target) is consistent for each execution of the unit test and secondly the unit test itself needs to perform a check of the results and output “pass” or “fail”. The initialisation script is responsible for preparing the unit test and this typically involves. Using a dataset that is always the same for all unit tests is necessary to ensure that the unit test is consistent between tests. Consistency ensures that for successive executions, whether by same developer at different times or by different developers, the same results will be generated. This consistency ensures that as code is updated we then identify any defects that may have crept into the code. The source data set is either one or more tables or flat files. Managing a consistent source file is relatively easy to do: we just create the file and save it in a folder specifically for holding unit test data. Within the file format used in the dataflow a parameter is used to define the location and filename of the file being loaded – the initialisation script defines this parameter and in the production job a different script defines the location in the production environment. If we have a dataflow that is loading from a source table to a target table then we ensure that the source table contains a consistent set of data. Ideally each developer should be allocated their own database, or schema, and so are isolated from each other. Each developer then maintains the data in the source table required for the unit test. It is common that a target table for one data flow acts as a source table for another dataflow. In this situation we won’t be able to maintain the target table data as this is going to be overwritten when executing the unit test for the preceding dataflow. To overcome this we maintain the data elsewhere, in another table or flat file say, and then the initialisation script loads this data into the table prior to execution of the dataflow. For example consider a dataflow that is required to reject rows that have a null value in a certain column. We prepare our source data such that it does contain rows that have a null value and some rows that don’t. Then in our unit test we check that the required number of rows have been loaded and rejected. Therefore it is common to manually prepare the test data required by the unit test must either by updating some sample data or creating the data from scratch. It is also important to ensure that the target table also contains the same dataset. If, for example, we are testing a dataflow that is performing a Changed Data Capture (CDC) routine then we need some data in our target table in order to test that our updates, deletes and inserts perform as expected. In other cases we need to start with an empty target table. Again the initialisation script is used to prepare the target data. The second script we use in an automated unit test is a script that checks the results after the dataflow is executed and reports pass or fail for each check. This typical involves examining the data loaded or updated into the target table and is best explained by an example. Hence from this there are four different data scenarios that need to be implemented within our data flow and consequently there are four checks we need to make within our unit test. An example of such a check script can be seen below. There are four similar bits of code in the check script with each one checking that one of the four required scenarios has been implemented correctly. So the first bit of code checks for the first scenario which is the case when both first and last names are populated we get the correct result in the CUST_NAME column of first name and last name concatenated together with a space. Print statements are used to output the results and so after the unit test job has been executed a quick scan of the generated log file will tell you whether the dataflow has passed all tests of if some have failed. To help with debugging the print statements for the fail case display the value that is expected along with what was actually received. As well as dataflows we also identified custom functions and scripts as objects that can also be unit tested the next section looks at how we unit test these. To perform a unit test of a Custom Function a job is created that contains a script which executes the custom function. The script provides a set of known input parameters to the custom function and then checks that the return value is what is expected. For example if the custom function getRecordCount(tablename) returns the number of rows for a given table then the unit test script first populates a table with a fixed number of rows, then executes the custom function and finally checks that the return value is the same as the number of rows that were populated in the table. In the example script below we empty and populate the target table then check that the custom function under test returns the number of rows expected. Custom functions can however be more procedural in nature, that is, they do something rather than return values. A common example is to create a custom function that wraps the moving of a file of the operating systems file system. Here our test would be then to check that the function did indeed move the file correctly. Scripts are often used in SDS to perform some sort of routine functionality such as moving files on the file system, writing to log files, initialising variables and other such operational functionality. If a script is quite simple, for example, initialising the value of a variable then these probably do not need to be explicitly tested in isolation but can be tested along with a Dataflow. More complex scripts should be unit tested. In SDS it isn’t possible to execute a script on its own and so for unit testing we need to look how to isolate the script so that it can be tested. This is best explained by example. Consider a job that consists of a script followed by a dataflow. 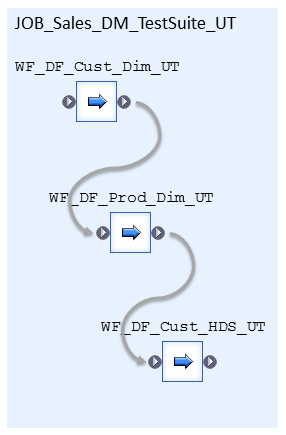 The script reads values from a properties table in a database and passes these as parameters to the dataflow. The unit test of the script is to check that the correct values are read from the properties table. In order to perform a unit test of the script in isolation (i.e. without also executing the dataflow) we embed the script within a workflow and then we can create a unit test job that contains the workflow. So our original job is now our workflow that contains our script followed by the dataflow. 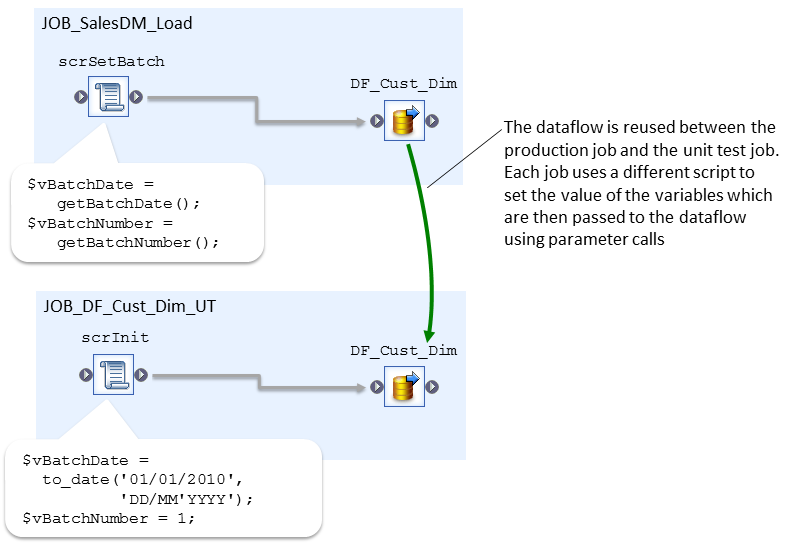 Note, parameter calls are required in order to pass the values in the script up through the workflow to the dataflow. The image below is of the unit test job and this contains the workflow followed by the script that checks the script results. 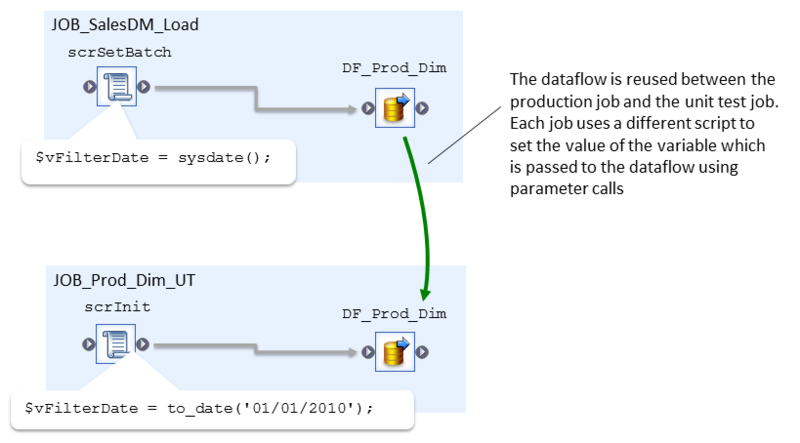 The original job contains the same workflow followed by the dataflow and is illustrated below. So in summary in order to unit test scripts we embed the script within a workflow so that the script can be shared between the original job and a unit test job. If a script is looking difficult to unit test then this may indicate that your overall design should be improved. For example a script that is performing several distinct activities should be split up (this leads to better structured, more manageable code and increases code reuse) or maybe some or all of the script would be better as a custom function (which also encourages code reuse). A test suite is a single job that executes a series of unit tests, typically covering an entire ELT process, for example, all the data flows that load a subject area within the data warehouse. Executing the test suite then checks the whole system and as such acts as a regression pack [http://softarc.blogspot.co.uk/2008/06/automated-regression-testing-why-what.html] for the system and typically this is executed prior to the packaging release of the system from development to test. Then we can build our test suite job by including these workflows in the test suite job. Note, although we could run the workflows in parallel we instead run them sequentially so that the print statements from the check result scripts are grouped together and are not intermixed. We still retain the original unit test jobs so that we are able to run a unit test on a single dataflow or object and the main use for the test suite above is to provide a regression pack which is typically run prior to the packaging and promotion of the complete ETL code to system test. An enhancement that can be made is to write the unit test results into a database from which they can then be analysed to produce overall metrics on the unit test process. This is fairly straightforward to do and essentially involves creating a new dataflow that executes at the end of the test suite which reads the log file, parses it and then writes the data to the required table. Unit testing is an essential part of any software development process and software developed using SAP Data Services is no different. Creating automated unit tests can bring significant benefits to a project, in particular improved overall quality through identification of defects and reduced overall cost as defects are found earlier in the system development life cycle. This article described an approach for unit testing in SAP Data Services that is robust, repeatable and through a simple extension allows the test results to be written to a database so that they can be readily analysed. I hope you found the article informative and that you consider implementing unit testing in your project!